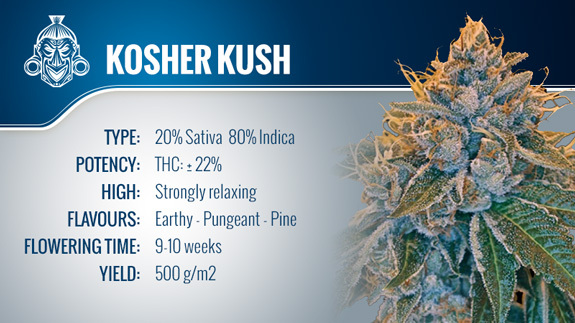 The sheer strength of Kosher Kush could have you think it’s heaven sent. Few strains out there that can deliver such a potent and pungent experience. From the masterminds of Reserva Privada comes the illustrious strain, Kosher Kush. Kosher Kush has been such a phenomenal success that it has won Best Indica at the 2010 and 2011 High Times Cannabis Cup, as well as the Indoor Hydro Cup and Indoor Bio Cup at Spannabis in 2012. According to Reserva Privada, Kosher Kush originated form the streets of LA. At the time a popular LA-based strain, jokingly known as “Jew’s Gold”, was sweeping across the city. When Reserva Privada came across that strain, they were blown away by its qualities - to the point where they contacted some of the local breeders and obtained some growing samples for themselves. With these samples, Reserva Privada took matters into their own hands, and with their superior expertise, started breeding it themselves – producing some truly noteworthy specimens. It was from these specimens that Reserva Privada decided to start opening up its seeds to the market; but the name Jew’s Gold, although a local nickname, didn’t sit right with them. Not wanting to move completely away from the origins, and the humour behind it, they decided to call it Kosher Kush - and with the strength it packs, it may well turn you into a believer. Kosher Kush is an extremely hard hitting indica that can knock the socks off even the most experienced and seasoned smoker. Novices should certainly exercise caution when first testing out this heavy weight – Remember, you can always have more, but you can’t have less! Kosher Kush is known for consistently producing high levels of THC, with 2012 lab reports finding one batch to have 29.6%! One of Kosher Kush’s most recognised traits is the extremely pungent odour it produces. It is a real nose full that can take you aback as you grind it. We would describe the flavour as being a predominantly dank and diesel mix, with strong, earthy overtones – and on the whole, highly enjoyable. Kosher Kush produces a very strong body stone that makes it ideal for those looking for a bit of rest and relaxation. The extreme potency of the stone makes it ideal for an end of day session, when you are winding down with friends, or sitting down after a hard day’s work. Whilst some people can power through it, don’t expect this beauty to be a conversation starter, it can have even the chattiest of stoners completely spaced out and enjoying the journey. 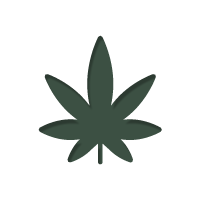 Although many medical marijuana users seek out high levels of CBD, there are advantages to be had from the sheer unbridled force of THC that pulses through Kosher Kush. Most notably this powerful mistress can be harnessed to treat chronic pain, stress, anxiety and Depression (to a lesser extent). Anecdotal reports have also seen it being used to help with Migraines, ADD/ADHD, Asthma (not as a smoke), and Anorexia. Kosher Kush is a strain that is easy to grow, but hard to master. Even the most novice of cultivators will be able to get results from this forgiving plant, but to really get the most out of her, you will have to give her a lot of tender loving care and effort (just as you would with anything worthwhile in life). Kosher Kush will thrive both indoors and outdoors, and has a flowering time of 9-10 weeks (harvest is September – October outdoors). Considering she is an indica, Kosher Kush can grow quite tall. Pinching and trimming is advised to more advanced cultivators in order to keep her under control. When done correctly, this can result in some insane levels of beautifully frosty trichomes. As mentioned, the potency of this strain is mind blowing, with a THC level of 29.6% being recorded. In terms of yield, Kosher Kush can produce up to 550 grams/m2 under an experienced hand. On the whole, the ease of cultivation and the potency this powerhouse packs makes Kosher Kush an all-round winner in our eyes - highly recommend. However, be aware that the raw power of Kosher Kush delivers the ultimate indica buzz, so if you are used to a sativa - beware.